Here is a post that talks about one of the best inkjet printers 2013. The Epson printers have released a lot in Latin America, all for the economy that offers to consumers, these printers have presented in recent years a bid of a conquer what is looked for in the market, continuous ink systems are very fashion by its promising help to save a large proportion of money compared with conventional consumables used until today like ink cartridges and toner cartridges. These Printers are called ink tanks they have been introduced to the market as Epson pioneers of these systems, previously they were adapted to Epson Printers ink, and these have never been originally created by the ink manufacturer integrated system so far. We must recognize that these printers have been a resounding success, thus Epson has decided to continue with the production even photo printers and home printers of this type. The printer that deserves the award as the better in 2013 printer is the Epson L200 printer with ink tanks factory, this printer can print approximately 15,000 pages before the warranty expires, it is so far the only problem but we can make a reset pillows filled on this printer. The cost per page (CPP) for this printer is extremely affordable and can get about 27 pages per minute in black; they are printers for home and small businesses because they are inkjet use. With an integrated printhead and ink system which is filled with tanks with original ink which bring a code that activates the ink level, you can also use generic ink to fill Epson ink systems and use codes to reset these ink containers. These are easy to refill ink and the cost of the consumable ink pots is very economical compared to what we get on pages as they receive in each of these ink pot an average of 5,000 pages. These printers are practical for printing photographs since we can highlight the colors with a software component called Epson ink systems Easy Photo Fix, applying changes to photos with this software can obtain better quality in our printing photos. All printers of this type have this program and It has 1200 DPI scanner for enlarging photos. With a full-speed USB 2.0 connection and a print resolution up to 5760 x 1440 dpi in the main tray this printer can support up to 100 pages and supports paper sizes Letter, Legal (21,6 x 35,6cm) A4, B5, A5, A6, report, executive, statement, user-defined: (8.9 to 21.6 cm) x (8.9 to 111,7cm) Envelopes: No. 10, DL, C6 also it is compatible with Windows® 7, Windows Vista®, Windows XP, Windows XP Professional x64 operating systems. Prints up to 27 pages per minute, using ink tanks, prints, copies and scans. Printing Cost very economical Epson ink tanks easy to recharge. 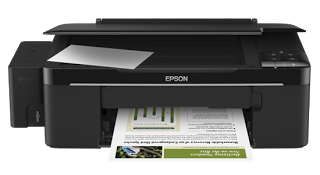 Only domestic printer for reduced wear, use ink tanks and the same supplies that Epson L200 it is the only printer for home use fewer pages with ink system integrated factory. The same speed of 27 pages per minute and supplies aforementioned easy to load. Qualities like the Epson L200, Factory brings three pots of black ink to about 12,000 pages it is faster because it prints up to 33 pages per minute in black and about 15 to color. With two year warranty and they gift a USB cable. It is a multifunctional printer with access to connect through wireless, it can print with ease from anywhere with a range of access as provided by the manufacturer's manual. It is among the few printers that we can print and scan from connected through wireless network. It is Special for photo printing and print 33 pages per minute. It is a printer ink tanks, inkjet for business use, integrated Wi-Fi and iPrint to print from mobile phones, tablet and other mobile devices. Three bottles of black ink and three bottles of color ink is the resistance of this printer it offers automatic paper feed to scan and copy documents at the top, send and receive fax manually or automatically. These are printers that we consider profitable and low costs for purchase, note that you have to analyze what is your need, not all printers have the same resistance.